1999 JU3: It doesn't sound like a very noteworthy name. It's just one of more than 5,000 Apollo-class asteroids. But 1999 JU3 could become a household name if Japan succeeds in mining it—a mission that JAXA has struggled with for decades, often disastrously. And on Sunday, it revealed the probe that could redeem it. Four years ago, a Japanese spacecraft called Hayabusa returned to Earth after a nearly decade-long journey through space. It bore precious cargo: Dust. More specifically, about 1,500 grains of dust—or about one-millionth of a gram—collected from an asteroid called Itokawa more than 200 million miles away. It was a historic moment, but it was also a disappointment. Hayabusa wasn't just supposed to bring back a handful of dust. It was supposed to mine the asteroid and cart back evidence that would reveal incredible things about the origins of the universe. JAXA scientists collect the original Hayabusa sample after it returned to Earth. Image: JAXA. What happened? As this excellent blow-by-blow from Jonathan O'Callaghan explains, a long string of malfunctions: A solar flare screwed up its solar panels. It had issues with its existing power sources and navigation systems. When it finally did reach the asteroid, the probe it sent down to the surface "drifted off into space, never to be heard from again," says O'Callaghan. When Hayabusa itself attempted to land, communications were lost, and it's now believed that the probe bounced off the surface several times. The system that was designed to "mine" it failed. Finally, the probe launched itself back into orbit, dragging only a tiny bit of dust from the rock it was designed to dig into. The problems didn't end there—there was a month of radio silence, a fuel thruster leak, and more—but Hayabusa eventually made it back to Earth, thanks to some brilliant fixes dreamt up by JAXA. And while the speck of dust it brought back was certainly useful and historic, the core of the mission had failed. So on Sunday, when JAXA unveiled the completed spacecraft designed to redeem the project, its name was no surprise; Hayabusa-2, which will launch sometime this year, will finish what its predecessor started. The probe will make a four-year journey to 1999 JU3, where it will do a series of extraordinary things. First, it will put down a lander and three "hopping" rovers on the surface. Then, it will fire a so-called "space cannon," essentially a metal bullet, down into the asteroid to collect samples from inside the body. Basically, Hayabusa 2 will drop a bomb on this piece of rock and then land inside the subsequent crater (a dramatic premise reflected in this mock film trailer for the project). It's an incredibly ambitious program, and it's inspiring given the dearth of funding that NASA is currently struggling with. But what makes it really exciting, and what brings us back to ol' 1999 JU3, is what it'll be bringing back. One theory as to how amino acids first arrived on Earth is that they hitch-hiked on asteroids or comets that bombarded our infant planet. But to prove this, researchers must first find amino acids on space rocks. The dust gathered could tell if amino acids first arrived on Earth by hitch-hiking on asteroids or comets that bombarded our infant planet. Last year NASA confirmed that its Stardust mission had captured amino acids from the tail of the icy comet Wild 2. But asteroid 1999 JU3, which thermal imaging indicates is rich in carbon compounds, is much closer to Earth and may therefore provide new insights into life's origins. 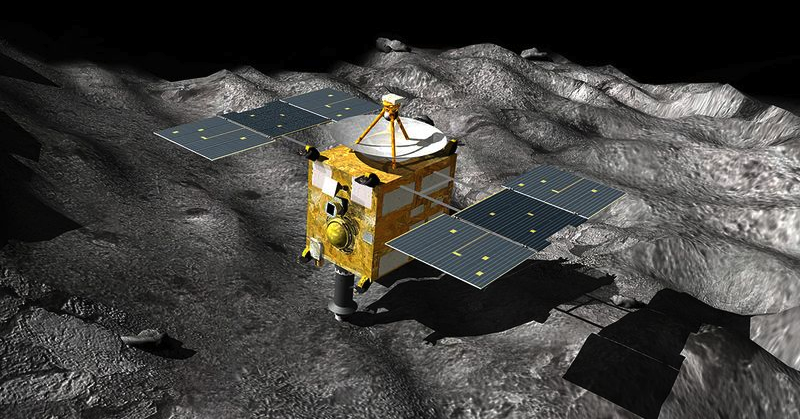 Hayabusa has been a long, expensive, problem-ridden space program. It's the kind of space program that many would say isn't worth the cost. But, as we're seeing on the eve of its second life, it's also the kind of space program that could end up altering our understanding of how life on Earth came to be. If that's not enough of a justification, I don't know what is.